Chatsworth's Italian Gardens were laid out by Sir Joseph Paxton for his patron the sixth Duke of Devonshire. 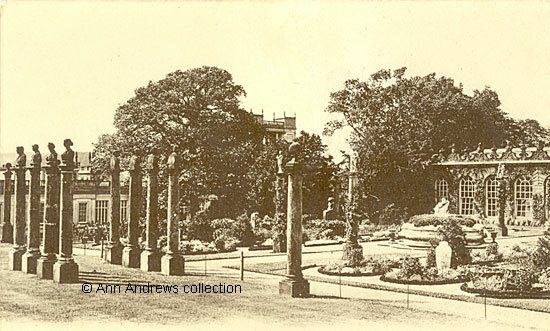 "Opposite the Orangery is the ITALIAN GARDEN, with its forest of pillars surmounted by busts, its grand old Egyptian figures, its Chinese beakers and vases, its sculptured figures and groups, and its raised parterres, and near this are the greenhouses, conservatories, and camelia and orchid houses, with their endless store of beauties." "If Chatsworth is delightful indoors, it is none the less charming out-of-doors, with its terraces and lawns, its French Garden: a forest of tall columns crowned with busts and trellised with leaves; its fountains and its cascades, and its great conservatory, from which the idea of the Crystal Palace was taken". When Potter visited Chatsworth and took these pictures most of the columns were covered with greenery - probably ivy by the shape of the leaves. It created a slightly curious effect as some of the busts look as if they are either peering over a hedge or perhaps are wearing ivy skirts! There does seem to be some confusion in the various old Guides and the few newspaper accounts as to whether this part of the garden was French or Italian. There are antique prints depicting it as both a French and Italian Garden but the scene is the same. However, a Rock lithograph shows the Italian Garden designed by Paxton as being the long garden running in front of the house. Italian Renaissance gardens were filled with statues, fountains and water features and Chatsworth is especially famous for its Great Cascade. A lithograph of the Italian Garden, published by Rock & Co. in 1863 is in V&A's collection. Chatsworth and its gardens were visited by both English and Russian Royalty during the nineteenth century and they all planted trees to mark the occasion. In 1816 his Imperial Highness Grand Duke Michael Pavlovich of Russia (1789-1849) and his older brother, who became the Emperor Nicholas I (1796-1855), visited Chatsworth House. The future Russian Tsar planted an Spanish Chestnut near the western portico whereas the Grand Duke planted a variegated Sycamore. Grand Duke Michael re-visited Chatsworth in October 1843. Princess Victoria, later Queen Victoria, stayed at Chatsworth with her mother in 1832. They also both planted trees; Princess Victoria's choice was a British Oak and her mother opted for an American Chestnut. The Royal party must have seen a rare plant, Buonapartia Juntia, that was then in flower at Chatsworth. This was a rarity as it was only the second time it had flowered since arriving in England from Chile about 32 years previously. Queen Victoria returned to Chatsworth in 1843 when she and Prince Albert were making a tour of the Midlands. The couple went to the south end of the Italian garden which was where Victoria's and the Duchess's trees had been planted. This time it was Prince Albert's turn to do the honours and he chose a sycamore from a number of trees that had been prepared for the occasion. 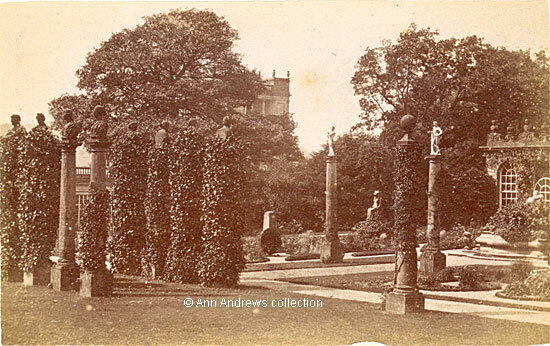 The third image, captioned the French Garden, is from a postcard published by Sneath of Sheffield. Although it was posted in 1920, the original picture is likely to have been taken some years before and probably before the first war. Some of the columns had lost their greenery whereas others were becoming covered. There were other subtle changes. A row of posts had been put in on one side of the path, perhaps for fencing. On the edge of the path, but between the double row of columns on the left, is a litter bin. "The part of the gardens entered upon from the orangery is called the French gardens. They are adorned with lofty columns surmounted with statues" (1879). Derbyshire's Parishes, 1811, Parishes C, which has much more about Chatsworth..
1. and 2. 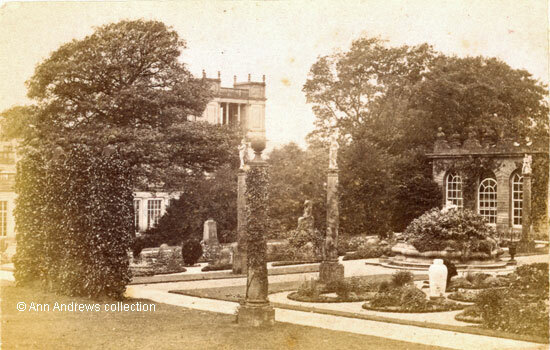 [Italian Garden at Chatsworth] Two photographs by W. Potter, Matlock. Copyright. The CDV is an albumen print mounted on a small card measuring 6.3cm x 10.4cm. No date, but probably taken around 1888, if not earlier. 3. "French Gardens, Chatsworth". The Peak Series. R. Sneath, Publisher, Sheffield. Posted on 17 Dec 1920 at Chesterfield. CDVs and postcard in the collection of, provided by and © Ann Andrews. "Black's Tourist Guide to Derbyshire" (1888) pub. Adam and Charles Black Edinburgh. Adam, W. (1840) "The Gem of the Peak" London; Longman & Co., Paternoster Row MDCCCXL. "Buxton Advertiser", 27 November 1880. "Morning Chronicle", 11 December 1816. "Derbyshire Courier, 21 October 1843. Grand Duke Michael of Russia's second visit. "Derby Mercury", 24 October 1832. Visit reported, though not the tree planting. "Derby Mercury", 31 October 1832. "Derbyshire Courier, 9 December 1843 and almost fifty years later in the "Derbyshire Advertiser and Journal", 22 May 1891. "Ossett Observer", 16 August 1879.